Mr. Dalrymple’s hands, thin and more used to pens than to cutlery – or garden spades – crossed soothingly over his full stomach as he leaned back in his chair. Mr. Dalrymple’s housekeeper, a satisfied little smile on her broad, bony face, cleared the plates with strong hands, towering over the table. Charles Murray of Letho, who had eaten heartily but was younger and fitter, politely agreed. He had ridden some distance that day over unimpressive roads and had no particular wish to spend the evening digging in someone else’s garden, even that of his old university tutor. It was early March and still bitterly cold in this broad valley by the Tay, and his fingers and toes were only just thawed out. Mr. Dalrymple’s special brandy was excellent, the fire was good, the grey-green panelled dining room candlelit and cosy: his country estate at Letho was still some miles away but Mr. Dalrymple had offered him a bed for the night here in Newburgh and his horse was well stabled at the inn. Murray was in no hurry: he wanted only to stretch his legs towards the fireplace, cradle his brandy, and claik of old times. It was not immediately to be. ‘Come, anyway, and I shall show you the trees,’ said Mr. Dalrymple. He had retired from teaching when his health grew poor, but a few years here on the banks of the Tay seemed to have rejuvenated him, to Murray’s delight. Whether the gardening was a contributing factor or a result, he was not sure. He unfolded his long legs from beneath the table and followed Mr. Dalrymple out of the dining room and along a stone passage to the back of the house. Over his tutor’s head he could see the passage descend a few steps before a door opened to the left to the kitchen, to judge by the smell of food. Ahead there was another door, closed at present, looking more like a sturdy outside door. The large key was already in the lock but Mr. Dalrymple merely turned the handle, and led the way down even more steps into a steep, sharp garden, so steep that although the walls were over six feet tall, from the house one could see straight over the wall at the foot of the garden, over the assortment of busy little houses in the broad river valley, and down to the serried masts in the harbour, fishing boats unloading salmon, and even ships transferring cargo to smaller craft for the ongoing journey to Perth. Lights were beginning to spring out of the twilight, swaying on mastheads, warming windows, reflecting in the dark water. Swooping specks of rooks inspected treetop roosts. The sun had nearly vanished in a winter-lit sky: it was going to be another frosty night. ‘You know all this was land belonging to Lindores Abbey,’ Mr. Dalrymple was explaining, his face beginning to blur in the dusk. Murray pulled himself back at the practised tutorial tone of the old clergyman. ‘I had some idea of that …’ he agreed. He had read most of his grandfather’s books, some of which were about Fife. ‘Specifically, these were the orchards here beside the river. Nearly every garden in the town has old apple trees in it, good ones, too. The sons and daughters, or grandsons and granddaughters, of the very trees attended by the monks themselves. A notion which appeals to me greatly, you can imagine, as a man of the cloth – reformed – myself. ‘I have brought on these two trees from seed and now they are ready to replace this poor old fellow.’ He patted a thick trunk standing amongst three or four other trees on the grassy slope. The way it shuddered showed its roots were no longer sound, and a couple of branches already lay on the frosty grass, easily snapped off, ready firewood. A man was indeed gathering them into handy bundles, breaking them in thick, strong hands. His boots were rooted in the grass, feet apart, brown skin like tree bark, his bare head stubbly. ‘The gardener, Adam,’ said Mr. Dalrymple, with a wrinkle of his eyebrows to show that all the wry comments had been made. Adam nodded, shining clear, blue, innocent eyes on Murray. Not quite the full pint, thought Murray, unjudging. He smiled at Adam: he liked gardeners, on the whole. ‘Have ye come oot to dig, sirs?’ asked Adam, smiling wetly. His voice was surprisingly musical. ‘Well, no …’ said Mr. Dalrymple. ‘Well … We ought not, really. Mr. Murray here is young and fit, but I am not, and besides, Mrs. Ferguson’s dinner … delicious, but …’ He looked wistfully at his saplings, at the old tree, and at the spade propped against it. Murray poked the earth with a toe: the ground did not seem too hard. ‘Perhaps, sir, you would let me?’ he offered, trying not to sound too reluctant. Even in the dimming light he could swear he saw Mr. Dalrymple’s eyes light up. But with that word, there came the most appalling crash from the house. All three men jumped, and the spade fell to the ground in a little echoing thump. ‘What was that?’ gasped Mr. Dalrymple. ‘May I, sir?’ asked Murray, and without waiting for an answer he sprinted back up the hill to the house. At the kitchen door, he stopped, finding Mr. Dalrymple impressively close behind him. Mrs. Ferguson was standing in the middle of the kitchen, her back to the table, hands still in the air as if to ward off whatever had happened, a look of white shock on her face. And every pot and pan in the place was tumbled on the stone floor in a glowing copper heap. ‘What on earth …?’ demanded Mr. Dalrymple. Mrs. Ferguson dropped her hands and stared at them. Her face, lightly sheened with sweat from the fire, had a glazed look, and Murray was suddenly put in mind of a large-scale Staffordshire flatback. ‘No, sir, thank you for asking.’ She put a hand to her broad chest and took a deep breath, as if to make sure she still could. ‘Oh, sir, I didn’t want to bother you,’ she said with an anxious smile. ‘I thought it would hold all right. At least your brandy is safe, sir,’ she added, indicating a dusty bottle on the table. Mr. Dalrymple smiled. Of course Murray picked up most of them, arranging them on the central table which was already laden with bowls and jugs and a rather attractive soup tureen. There was a bench below the wall where the pans had evidently hung, and Murray would have expected the bowls and plates to have been stacked on there rather than taking up space on the table where the food preparation would go on. It was lucky that they had been moved away before the pans had fallen, and it seemed best to keep it clear now until the hook rack had been fixed. By the time they were done, the light had pretty much gone and even Mr. Dalrymple seemed disinclined to dig his garden. Mrs. Ferguson brought them cake and more of the precious brandy, and the gentlemen retreated to Mr. Dalrymple’s book-lined study, to a couple of well-cushioned armchairs and another lively fire, and pleasant reminiscences of times past. Murray woke next morning at dawn, before Mrs. Ferguson had appeared with his hot water. He blinked at the unfamiliar bed curtains, neatly embroidered but rather old and worn, probably family possessions. He found his dressing gown, pulled it on and slid out of bed, wrapping himself tightly against the cold. The knotted cloth mat by the bed had a hard chill, but the bare wooden floorboards were icy. He hopped across to the window and opened the shutters into blades of winter sunlight, shattered into a splendour of shards by the frost on the window. He paused to wonder at the fern patterns of the frost before he pressed a long hand into the midst of them, melting a watery viewing hole on the glass. Smeared by the melting ice, the town and the harbour lay before him. Beyond the bright blue of the river, yellow sedge and green pastures led up to a fringe of woodland on the skyline, stripes of colour woven over with the black masts of the serried boats in the harbour. Breakfast smoke was rising from the little houses on the flat land below. The apple trees in the garden reached frosty fingers up and out, towards sky and river. And between the apple trees and the house, slap in the middle of the garden’s small, steep lawn, was a travelling stall. It took Murray a moment to realise what he was looking at, though it was a large one, nearly half the width of the garden in length. It was a four-wheeled, smartly painted, boxed cart, an eye-catching yellow and red, large enough to be drawn by a horse rather than by hand – the shafts were propped up in the nearest tree. Along the side, in glossy letters, it read, ‘Doctor Alberius Strachan: Reliable Cures for All Illnesses and Injuries’. A hen, perhaps a potential customer, pecked curiously at one wheel. By the time he had shaved himself and dressed – and he did not take long – and gone downstairs, his host and the housekeeper and the gardener were all gathered about Dr. Strachan’s pantechnicon, as curious as the hen and a little more shocked. There was little conversation: it seemed that the arrival of the cart had struck all the household dumb. ‘Ah, Charles!’ said Mr. Dalrymple at last, waving at him with both hands with an air of despair. ‘I had observed that, Adam,’ agreed Dalrymple without rancour. ‘Where’s the horse?’ asked Mrs. Ferguson, with a hiccup that sounded almost like the first gulp of a slightly hysterical giggle. ‘Of course, Adam,’ said Dalrymple. Mr. Dalrymple stared around as if seeing his garden for the first time. Murray was examining the cart. It was well-made, but a little loose at the joints. He followed the tracks of the wheels back across the frosty grass, into which they had cut dark lines, to a spot near the wall not far from the gate. ‘Confooter it! The thing’s lept the wall!’ cried Adam, seeing where the tracks ended. Certainly they were well dug in there, as if they had hit the ground hard. Murray was less inclined, however, to believe in flying medicine wagons. ‘Never at all. A traveller, maybe?’ she suggested. 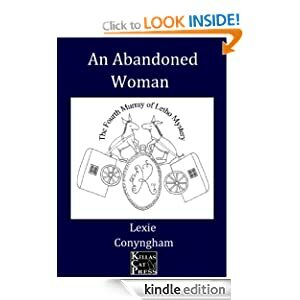 Her hands were still clutching her apron as if the shock of the discovery had not left her. Murray turned back to the wall, which interested him. ‘Do you lock this gate at night?’ he asked. ‘Oh, aye,’ asserted Mrs. Ferguson. ‘Adam lives down by the river, Charles,’ Mr. Dalrymple added. ‘Hmm.’ Murray was only half-listening. He tried the gate, and let himself out into a steep lane which led down the side of the house and garden towards the river. Three long paces would take him to the wall of the next house. Had the gate been wide enough to admit the cart, the cart could never have turned the corner to get in, not with a horse in the shafts. He looked up at the garden wall from the outside. It was above six feet tall, and while the gate was only five and a half feet or so, it was built into an archway: no one could have climbed over it when it was shut, or not more easily than over the wall itself. He glanced up and down the lane, then noticed something half-hidden by the grass at the lane’s edge. He poked with his stick, and uncovered a large square tin, painted, and upended. There was writing on the side nearest the wall, and he bent down and turned the tin over. ‘Doctor Strachan’s Special Salts’, it said, in flowery writing. ‘I think you’ve strayed,’ said Murray to the tin, and picked it up. He slid the top off carefully, and sniffed at the white powder inside. It had a slightly glittery look, and an empty smell. He dabbed one long finger in and licked it very cautiously: soda powder. Mr. Dalrymple was leaning out of the gateway as if afraid of what the world might be like outside, when the garden was confusing enough. from Mr. Dalrymple, spent the next hour or so emptying the various medicines from their shelves and finding how the box that fitted on top of the cart folded up, so it could be carried back out into the lane. Then it was a matter of detaching the shafts, loosening the wheels – comparatively easily, since they must have been off the axles only a few hours since – and taking all the pieces out one by one through the gate and up on to the main street, where, to the general amusement of the good people of Newburgh, they put it together again. After that it was more than time for breakfast, and having secured the services of a small boy to watch the cart, they returned to the house. In the kitchen, they noticed as they passed, a solid man was taking a cup of ale, and Mr. Dalrymple greeted him. ‘That’s right, sir: all done now,’ said Munro, keeking his head back. The rack was up, the pans gleaming, the bench below them tidy with dishes and bowls. It had indeed been fortunate, then, Murray thought to himself, that none of the dishes and bowls had been broken when the pans fell – but then they had all been on the table. Interesting, he thought. ‘Do you know of a Dr. Strachan visiting the town, Mr. Munro?’ he asked, on the offchance. Dr. Strachan, if doctor he was, was indeed staying at the inn, across the main street from the Dalrymple house and a few doors up. It was a long, low building, but an archway led into the usual stableyard. Murray paused before entering the main doorway and went to enquire, and found that the doctor’s horse was safely stabled, eating more than its fair share of anything it could get its teeth into. His own horse looked comfortable in the next stall. The stable lad was not particularly bright: he noticed, when prompted, that the doctor’s cart had gone from where it had been left in the yard, but could not say when or how it had vanished. Murray returned to the street and with Mr. Dalrymple made his way into the inn. Dr. Strachan had a room to himself on the first floor, over the entrance hall. As far as the innkeeper knew, he was still there: the doctor had spent the evening with a couple of locals sampling the best ales of the house along with a few glasses of brandy. The innkeeper had the air of a man struggling to balance in his head the disadvantages of having a guest paralytically drunk with the advantages of the income the guest was going to furnish, down to and including the cost of any hangover cures that the inn might provide, though in the case of a travelling medicine man he might prefer to use his own products. The innkeeper followed Murray and Dalrymple upstairs to show them the room, and stayed to watch in case there might be more money to make. The room was still dark, though it was nearly noon. The shutters were firmly closed. Murray stepped carefully round the curtained bed and opened them, then pulled back the bedcurtains. A prodigious snore issued forth from a heap of humanity, along with a very strong smell of ale and sweat. ‘Good Heavens! Dr. Strachan?’ Mr. Dalrymple was more polite than perhaps the occasion warranted. Murray tugged the bundled form by the shoulder, but it resisted, grumpily. ‘No, no, no, no, no,’ said the good doctor, eyes firmly shut. He had the bedclothes wound about him so securely that he could hardly have moved if he had wanted to. Murray shook him again, but the result was even less coherent this time. ‘Thu- ma- wau- wa- shilk shtockings …’ said the doctor in apparent satisfaction, and a vacant smirk drooped his face. He dribbled. ‘Oh, dear, oh, dear,’ said Mr. Dalrymple, wiping his own mouth with his handkerchief as if in sympathy. The innkeeper nodded, grinning, and the three men left the room quietly. Another great snore drowned the noise of their footsteps, in any case. ‘Who were the local lads he was drinking with?’ asked Murray as they returned to the door, not that the names would mean anything to him. ‘Och, young Robbie and Willie,’ said the innkeeper dismissively. ‘Maybe from the stranger? I dinna ken,’ said the innkeeper, unconcerned where the money started as long as it ended up with him, and he had already turned away before they had left the doorway. ‘Is Robbie Munro anything to Mrs. Ferguson’s brother, then?’ Murray asked, as Mr. Dalrymple frowned absently. ‘I’m fairly sure.’ They walked in silence back across the broad, sloping main street to Mr. Dalrymple’s house. Back in the garden, the frost had melted in the winter sunlight. The river glowed blue in the busy harbour, and the air was fresh up here on the hill. Adam had been tidying after the mess made by the cart, and now only the dark tracks showed in the grass, from the wall to the apple trees, along with a few minor scars where the shafts had broken twigs. Adam brought the spades again, and once more Mr. Dalrymple and Murray removed their coats and mufflers, laying them on the log where Mr. Dalrymple had sat earlier. Mrs. Ferguson could be seen at the kitchen window, watching their progress, and Mr. Dalrymple gave her a little wave. With a professional air, he swung up the blade of the spade and assessed the sharpness of its tip with the pad of his thumb: finding it satisfactory, he lowered it carefully to the best position, and jiggled his feet to balance himself. Mrs. Ferguson was now at the top of the steps, observing with interest. Mr. Dalrymple tried one foot on the spade, found it not quite right, and changed feet. Mrs. Ferguson advanced to the path. Mr. Dalrymple took a breath, and pressed hard on the shoulder of the spade. With a clean slice, it slid into the crisp earth. With a sharp cry, Mrs. Ferguson fainted. This time it was Mr. Dalrymple who was there first, still clutching his spade. He dropped it on the path and crouched beside his housekeeper, patting her a little helplessly on the shoulder. Nevertheless the method seemed to work, and with a sick look Mrs. Ferguson sat up slowly, her shiny complexion greenish white. ‘My dear Mrs. Ferguson,’ said Mr. Dalrymple, ‘are you all right? Charles, can you – the ground is very cold.’ But Adam was already at her elbow, and between them the two older men lifted her gently on to the log seat, and all Charles could do was to fetch her wool shawl from the kitchen. ‘Och, tea, tea would be lovely. But I’ll get it myself, not trouble you, sir.’ She made to rise but the colour washed out of her cheeks again and she landed heavily back down, with Adam and Mr. Dalrymple each clutching an elbow. ‘You must be sickening for something, Mrs. Ferguson,’ said Mr. Dalrymple. Murray glanced at Adam. He had an odd expression on his face: somewhere between knowing and concern – no, more than concern. Wistfulness? ‘Is there a doctor I could fetch?’ Murray asked. ‘Well, if you’re sure … I’ll make you some tea,’ he added uncertainly. ‘Let me do it, sir, if you wish,’ said Murray, who though a gentleman had had to manage such things from time to time. In a few minutes he had encouraged the hot kettle to boil, identified the tea and the kitchen teapot and the cup Mrs. Ferguson seemed regularly to use, and found milk, and scraped a little sugar off the loaf to sprinkle into the hot medicinal mix. He took it out to the garden, where Adam and Mr. Dalrymple still stood guard over the housekeeper. Mr. Dalrymple relaxed when Mrs. Ferguson took the cup, as if the situation was now under control. He took up his spade. ‘Very good, sir,’ said Mrs. Ferguson, but she did not look as if she had heard her own words. Her pale face was fixed on the old apple tree, and the bare earth beneath it where they had been about to dig. Mr. Dalrymple returned to it: Murray did not know whether to keep his eye on him or on her, and nor, it seemed, did Adam. ‘Well, here we go!’ The spade seemed to inspire cheerfulness in the old clergyman, and now that he was ready he set the blade confidently near the roots, and dug in hard. The first scoop of earth came fresh and dark, and he applied himself to the second. Murray felt himself relaxing, too, as the sweet smell of the earth spread with the small heap of spoil. Adam propped himself on his own spade, standing where he could watch both Mr. Dalrymple and the housekeeper. A fourth scoop was flung out, then a fifth. And then a sixth, and it was not entirely brown. Instead, there was something white sticking out of it. Something white and long, curving a little, with bulbous ends. It was uncommonly like a bone. Mrs. Ferguson gave a little shriek, and Mr. Dalrymple stopped digging and stooped to touch it with his gloved finger. ‘It’s a bone,’ he said, lifting it up to examine more closely. ‘Probably a dog,’ said Adam with some emphasis, which seemed odd. The silence that followed was as loud as thunder. ‘You killed a man?’ asked Mr. Dalrymple, now as white as Mrs. Ferguson had been earlier. ‘I did, I killed him.’ She stared at him, straight into his eyes. Mr. Dalrymple turned to him, as if seeing him for the first time. 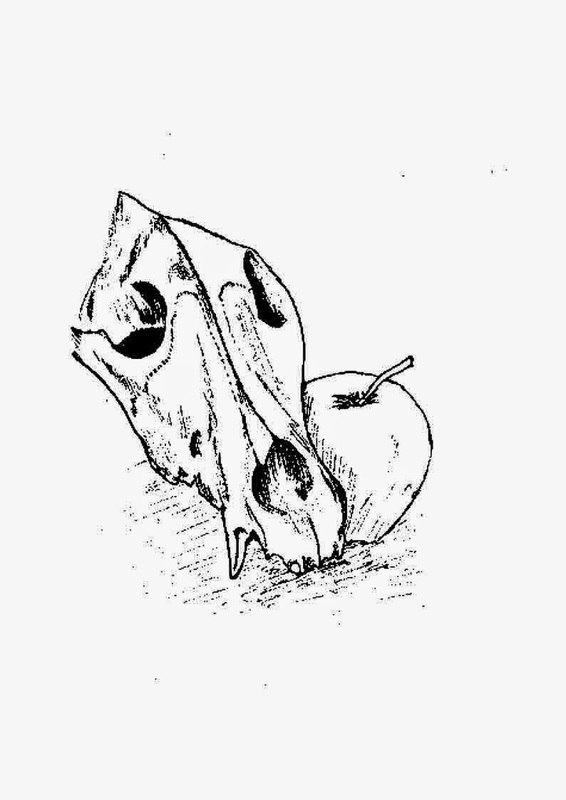 It was indeed a dog skull, long and thin, with sharp teeth, stained with the earth. It sat in his hand as if accustomed there, as he looked from it to Mrs. Ferguson. Mrs. Ferguson stared at it for a long, long moment, then quietly sank down into another faint. Old Mrs. Cruickshank had put Mrs. Ferguson to bed and was sitting with her, while Mr. Dalrymple and Murray, fortified with a pie from the hotel, were in front of the fire in the study. ‘So is Adam,’ said Murray softly. Mr. Dalrymple, too bewildered by the day’s events to ask too many questions, gave him directions to Adam’s small brown reed-thatched cottage down by the harbour. The door, even in the dusk, looked a touch too fragile to be knocked, so Murray rapped on a window shutter with a knock not intended to sound too imperious. Adam opened the door in a friendly way and, glancing back into his cottage, he shrugged and led Murray along the path outside instead, a little way upriver from the busy boats. ‘House too small for the likes of you, sir,’ he explained, with a grin. ‘I understand. Some of us simply grow too tall for practicalities,’ Murray agreed. They walked on a few paces. Away from the boats, there were fewer people about: it was early for the evening meal and late for the midday one. ‘Mm,’ said Adam. He held his large working hands tight together behind his back, and looked like a philosopher contemplating a knotty problem. ‘Unpleasant,’ Murray remarked in a hard voice. ‘And you’re just as fond of her, aren’t you?’ he asked. Adam looked away, and by the shape of him he was twisting his fingers hard together behind his back. ‘If he’d been there,’ agreed Adam. They walked on a few paces, deep in thought. He looked out at the darkening river, innocent and blue beyond the reeds. ‘You’d better tell her soon,’ Murray said to him. Adam smiled again, with his wet grin. ‘The apples have been grand,’ he remarked solemnly.